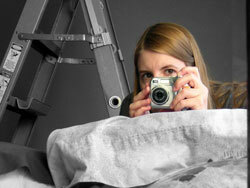 My name is Nicole, and I am a 30-something amateur photographer living in the greater Chicagoland area. I have a passion for nature, which is apparent by the subject matter of my photos. You will not find street photography here. What you will mostly see are flowers, trees, wildlife and picturesque scenes. As of 2008 I use the Canon EOS 40D for all my work, with the occasional odd photo taken with the Canon Powershot SD870 which I carry on me at most times. All prints are produced by Shutterfly and will be shipped directly from them to ensure timely delivery. Both glossy and matte finish are available, so remember to specify which you prefer when ordering. Please check here for pricing and ordering instructions. Standard sizes (4x6, 5x7, 8x10) are available on all photos, and the majority of the photos on this site can also be purchased in sizes up to 20x30, although you will have to inquire about pricing for prints 11x16 or larger. Black and white prints are available for all photos on this site. Please make sure when placing your order that you specify which photos you'd prefer to be printed in black and white. I prefer if you make your payment using Pay Pal, since it allows you to pay securely with a credit card, but I will accept money orders as well. This will delay your order, however. Shipping time depends on where you live. I will email you to give you an estimated date of arrival once your order has been placed. Please note that all photos are copyrighted and are not to be used in any form without my expressed written permission. Didn't find what you were looking for? Submit a question here.